Hello PMB Peeps! This is Michelle here today. I hope you had a good Valentine's Day yesterday. I made this card with Valentine's Day in mind, but you can also use it as an anniversary, apology or thinking of you card. I was looking over the Avocado Arts stamps in this month's Fresh Baked Kit and decided to feature the main character, the little owl. He was so nice, I used him twice. I stamped the image onto white cardstock twice and colored it in with Copics. I colored the images using different colors to make two distinct owls and fussy cut them. 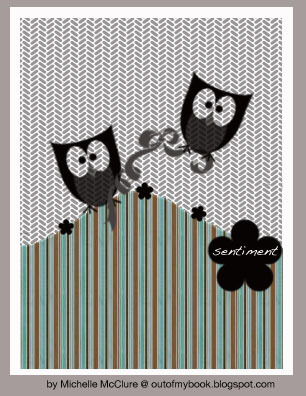 I designed this sketch to feature my two owls and the lovely patterned papers from Lily Bee Design. I adhered one owl onto the background flat and popped one up with foam tape for added dimension. I cut a little slit on their wings so the May Arts burgundy jute twine would fit and it would look like they were holding onto the twine. 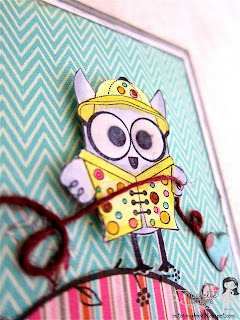 I connected the two owls with the twine in a loopy pattern using liquid adhesive signifying their connection to each other, even though it was a tangled web they wove. 1) I had printed out my sentiment on a plain piece of cardstock and then punched it out with a flower punch to attach onto my card, but decided against. I preferred the look of the black sentiment directly on the bold stripes. At this point my card was already assembled so I had to handwrite the sentiment directly onto the card. I'm not a huge fan of my handwriting, so I copied the look of my font using pencil. I made sure my punched heart would fit in the blank space, and then traced over the penciled writing with a black pen. When I was finished, I actually didn't mind my handwriting. 2) When I was placing the flying owl, I thought he looked better standing on the branch rather than floating in the air so I left him on the stamped branch. 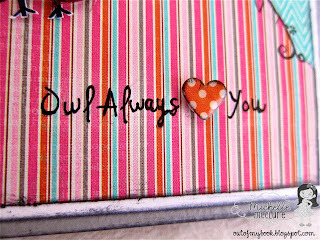 3) I added some hearts instead of flowers because it matched my sentiment better. 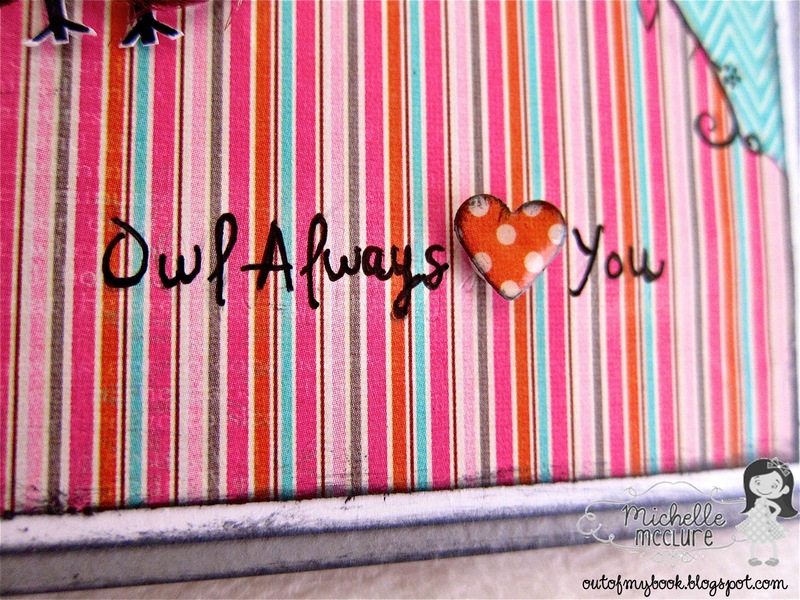 I put on the finishing touch by adding Glossy Accents onto my hearts and the owls' eyes for some added dimension and shine. Thanks for stopping by and see you next Wednesday! Fantastic project Michelle! 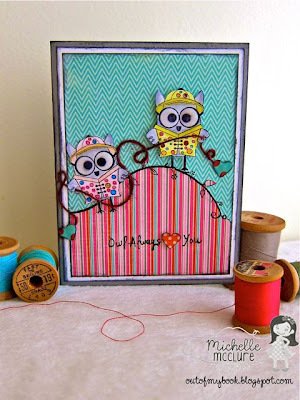 What an adorable card -- I love it! Awesome card, Michelle. Too cute!! How cute! I love the owls!